Below are the details of our 2017 Easter services at Brixworth and Holcot. All welcome, we would love to see you there. Family service featuring a donkey! A hour long service featuring a Sung Eucharist, followed by watch of the Passion. Feel free to come and worship. For the appointment of Sidesmen and the Independent Examiner or Auditor. and other matters of parochial or general Church interest. March Junior Church – what we did! It seems like no time has passed since last month’s Junior Church but spring is here and the daffodils are out on the walk up to our Church! After the initial hymn with the rest of the congregation we headed out to the Centre. We started with a warm up, and had great fun with a large dice, which everyone took turns to roll. The first roll decided what exercise to do and then the second, how many times we had to do it! We were really glad no one rolled for lots of press ups..
Then it was onto the carpet for our story. Today we looked at the story of Jesus and the Samaritan woman. This story was all about talking to people who are different to ourselves, and breaking down some barriers between the people of the world. We then asked each other if we had done a helpful deed that week. It was good to hear everyone contribute and there were lots of good deeds from the adults as well, someone had guided a stranger around a hospital, someone has helped a friend with a broken car, and someone had helped look for a missing child (who was thankfully found). 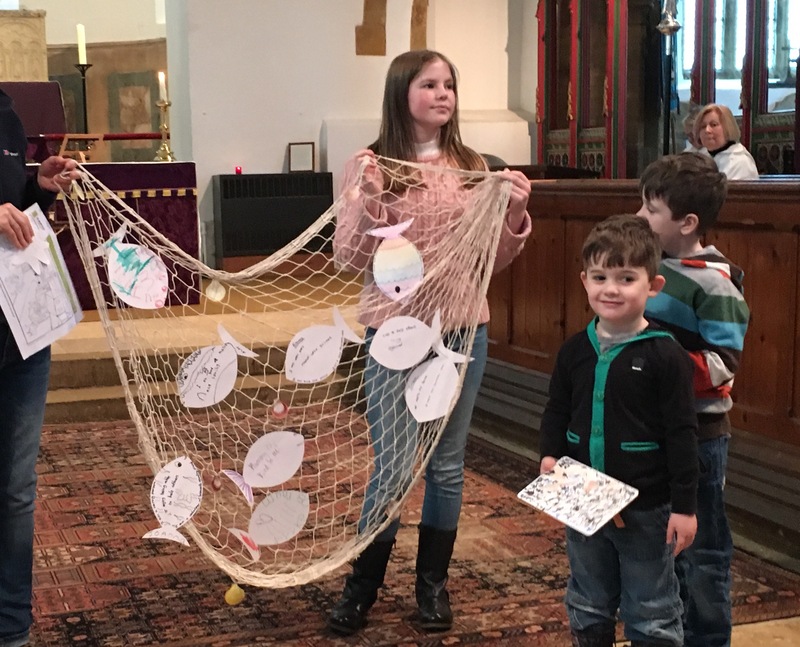 This then went into our fishing net which we took back into church with us to show the work we had done.We have also been given a task for this week. There is a piece missing from our fishing net.We all have to do a good deed to show we care for others, and write it on the star fish, these will be added to show us being good deed super stars! There is no Junior Church next month (April) so we’ll update you again in May! If you want a do a good deed and add a starfish to our net then feel free. “LIFE CALLING” A five session course on Vocation for Lent. A five session course on Vocation for Lent. Learn Lessons for Life this Lent. What does it mean to be truly “called by God”? God calls us to live our lives shaped and directed by his call. ‘Life Calling’ will help you to discover the meaning of vocation not only in your Christian Life, but also in your individual life and work. Wednesday March 8, 15, 22, 29 and April 5th at 7:30PM. Contact us for further details and location.